It's been a while since I last posted a Malay recipe. This is what I made last week with opor ayam (creamy chicken). The pineapple was spicy, sharp and sweet, the chicken was mild and creamy, perfect match. 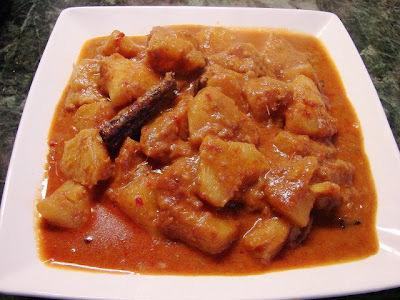 This pineapple curry is one of my favourite curry, very tasty. If you like curry and sweet & sour this is for you. Recipe is quite simple. All you need is a fresh pineapple** and some standard curry spices. *** Kerisik helps to thicken the sauce and also gives a nutty flavour. If you could not be bothered to make kerisik, can leave out curry still tastes very good. Blend the spice paste ingredients till smooth with a mini blender, can add the dried shrimps soaking water to help blending. Heat about 1/4 cup of oil in work then add whole spices stir for a while then add blended spice paste, curry powder, paprika and about 1 tsp salt, stir for few minutes till the paste has thickened and becoming very fragrant. Add in the pineapple, give it a stir for about a minute. Add enough hot water to nearly cover the pineapple, about 1 - 1.5 cup. If you like coconut milk add now. Let the liquid come to a rapid boil. Taste if you need more spicy heat, if yes add some chilli powder. Lower the heat and simmer for about 15 - 18 minutes or till the sauce has reduced and thickened to the consistency you like. While simmering the sauce may spit, so best to put the lid on ajar so steam can escape helping the sauce to reduce. When nearly done add kerisik. Finally taste to see if you need sugar and/or more salt. Nice serve hot or cold. Nice with plain rice or Malay turmeric rice. I had this with fresh bread lovely too. This curry is also great with added chicken pieces (raw or cooked) or king prawns (shrimps). If using raw chicken pieces add at the beginning, for cooked chicken or prawns add at the last few minutes. ** If you don't know how to peel and core a fresh pineapple here is a method. I like pacheri nanas. I can eat this alone with steamed rice and I am content.